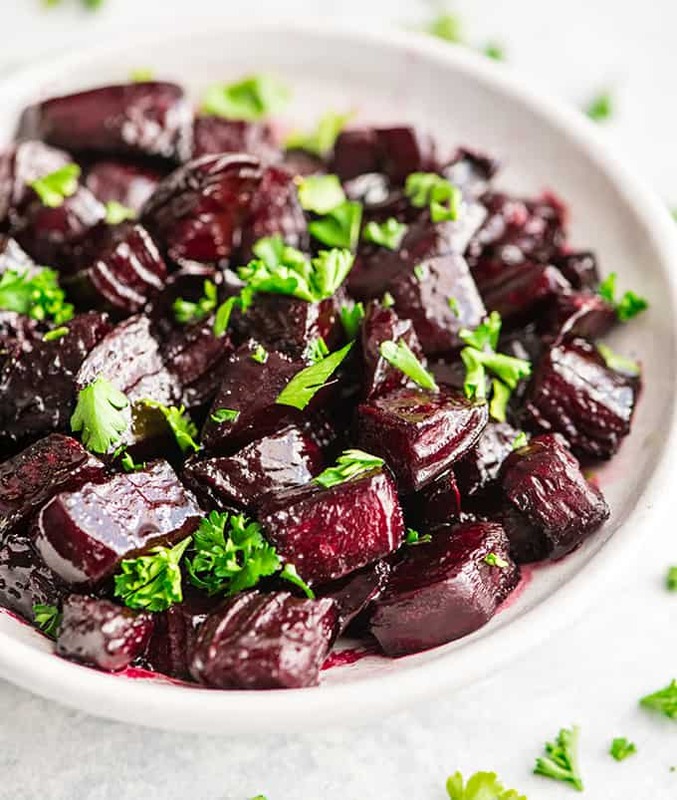 Made with 5 ingredients including fresh beets, this easy Balsamic Roasted Beets recipe is a great side dish or salad topper! They are gluten-free, dairy-free, Paleo and vegan-friendly! I absolutely adore beets. 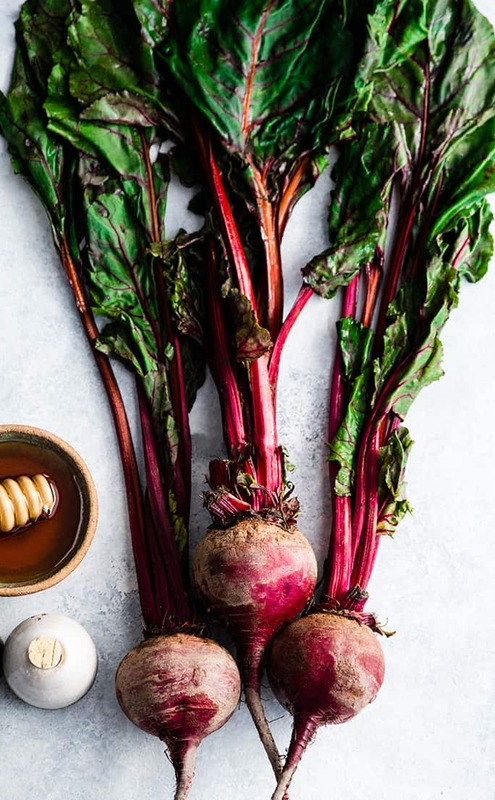 Whether they’re in a salad, blended into a smoothie or roasted and eaten all by themselves, beets are a delicious & versatile vegetable and nutritional powerhouse! This Balsamic Roasted Beets recipe is my favorite way to prepare fresh beets. Roasting brings out their natural sweetness, which is enhanced by a drizzle honey and balsamic vinegar! Roasting beets also give them the best texture (not mushy like boiled beets). These roasted beets taste like vegetable candy, and my kids even love eating them! 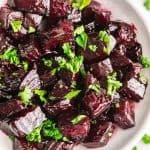 This balsamic roasted beets recipe is gluten-free, dairy-free, Paleo and vegan-friendly, so everyone can enjoy them! High concentration of nitrates which helps lower blood pressure and improve athletic performance. As you can see, incorporating beets in our diets is a stellar idea. I try to eat as many beets as possible, and often order a salad or dish at a restaurant based on the sole fact that the word “beet” is included in the description or title! With this roasted beets recipe I don’t have to go out to a restaurant, and I can enjoy the flavor of fresh beets cozy in my own home! How do you make Roasted Beets? Now that we’ve established that beets are amazing, let’s chat about making this roasted beets recipe! Use a vegetable peeler to remove the skin from the beets. This is a messy process, but will be worth it in the end! Peeling and chopping the beets before roasting cuts down the bake time significantly! How do you peel beets without staining your hands? If you would like to avoid staining your hands pink (something that doesn’t really bother me LOL) I suggest wearing rubber gloves. My husband always keeps rubber gloves on hand for a variety of reasons (cleaning up after sick kids, staining wood, de-seeding a dozen pomegranates, etc.) Wearing rubber gloves while peeling and cutting the fresh beets will ensure your hands stay nice and clean! 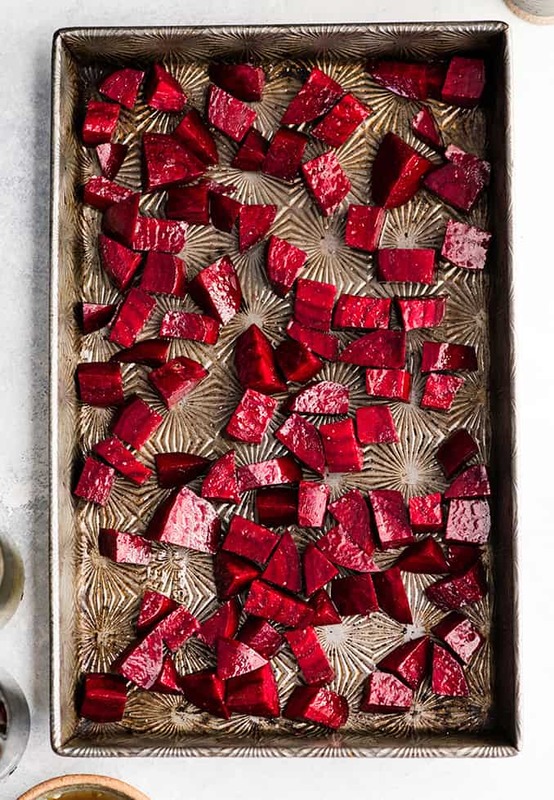 Do you have to peel beets before roasting? If you are roasting whole beets, I recommend waiting to peel the skin off after they have been roasted. However, peeling and cutting the fresh beets before they are roasted significantly cuts down baking time and makes the whole process go faster! In the recipe card I give instructions on how to make this recipe by roasting the beets whole first, and then peeling, chopping and drizzling with balsamic vinegar before roasting again. That is not my preferred method for making these balsamic roasted beets because it takes longer. 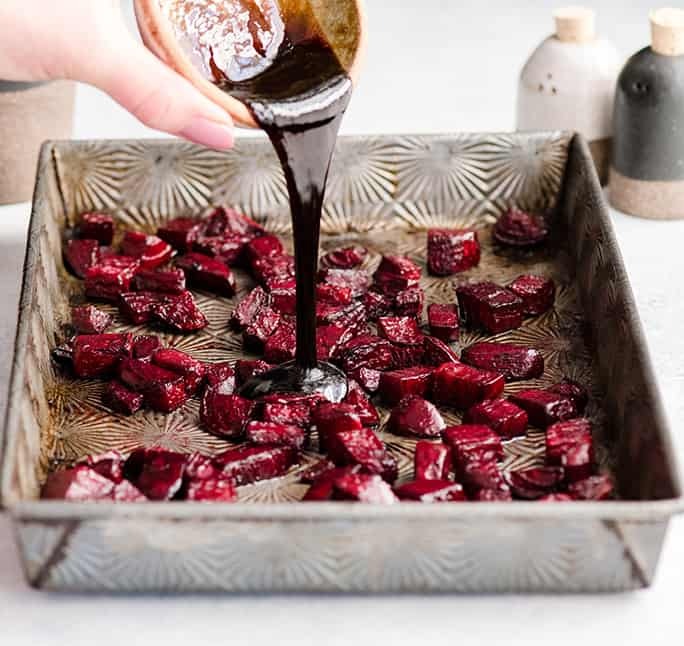 However, if you’re preparing a lot of beets and only want to make a few into this balsamic roasted beet recipe, then that might be your method of choice! The next step in making this roasted beets recipe is to drizzle the peeled & chopped beets with olive oil and sprinkle them with sea salt. Make sure to stir them well before adding them to the baking pan. Next, spread the beets in an even layer on a baking sheet or pan and roast them in the oven for 30 minutes, stirring once about 20 minutes in. Roasting the beets before adding the balsamic glaze will ensure that the glaze doesn’t burn before the beets are fully cooked! Drizzle the mixture of balsamic vinegar and honey over the partially roasted beets and stir until all the beets are evenly coated. Return the beets to the oven and roast an additional 10 minutes, stirring once halfway through. The beets are done when they are soft to the touch and the balsamic glaze has thickened and coated the them. Step 5: Remove from the oven and serve! If you’re serving these balsamic roasted beets as a side dish on their own, transfer them from the baking pan to a dish and serve! I chose to garnish them with chopped beet greens for a little fancy flare! You could use parsley, fresh rosemary, or basil for other delicious and beautiful garnish ideas! How do you store beets? If you plan on storing the beets in the refrigerator to use on top of salads or for meal prep for the week, simply put them in an airtight container in the refrigerator for up to 5 days. Reheat them in the microwave, oven, or on the stovetop if desired, or serve them cold! Can you freeze beets after cooking? Yes! You can freeze beets in an airtight, freezer-friendly container for up to a month. However these roasted beets are SO delicious if you’re anything like me half of the pan will be gone before you realize how many you ate! 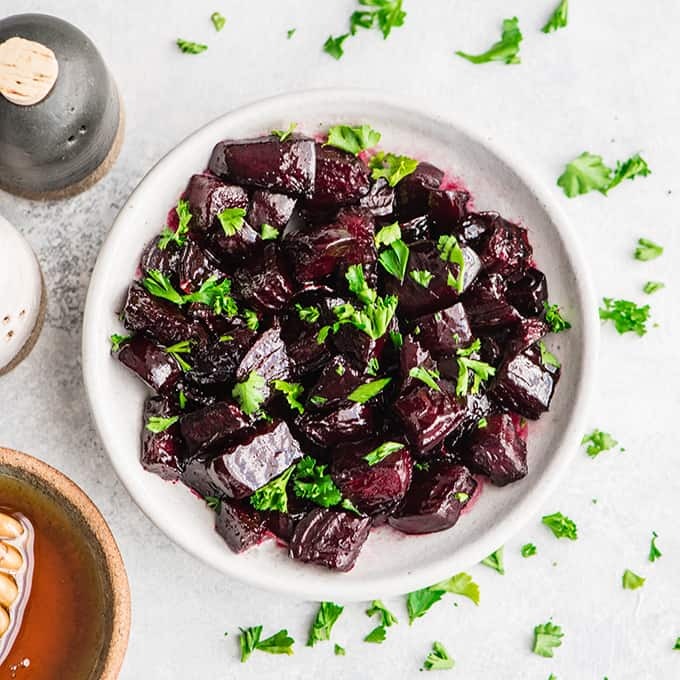 As always, let’s take a minute and chat about the ingredients used in this roasted beets recipe, and some potential substitutions! Fresh Beets. 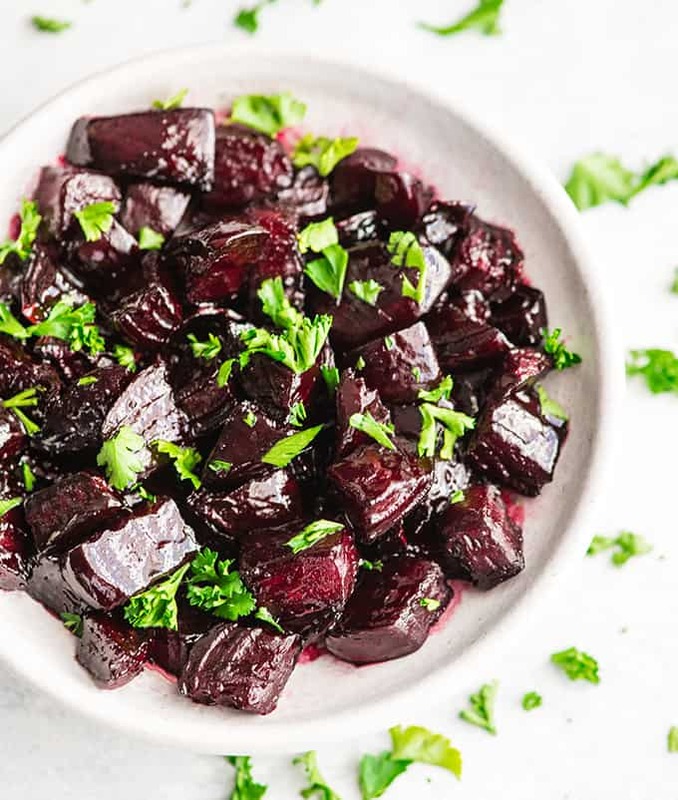 This roasted beet recipe is a great way to use fresh beets and still preserve their natural flavor, texture and nutrients. You could use drained canned beets, but fresh are so much better. 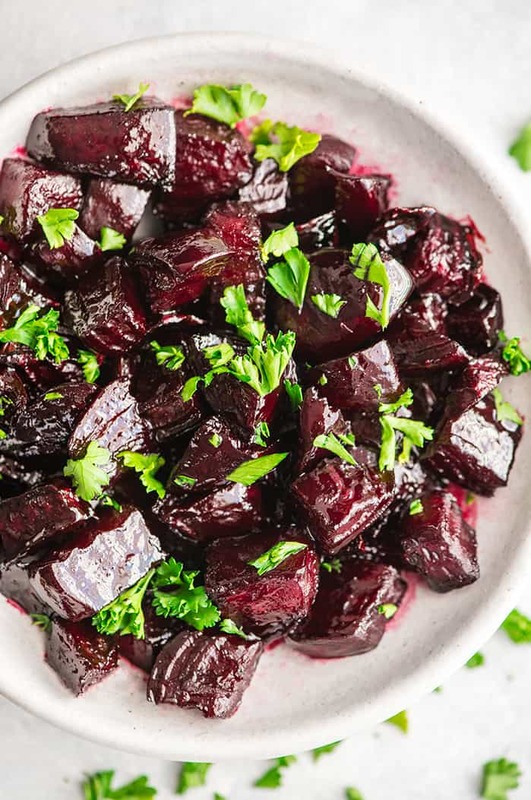 As for color, any color of beet (or a mixture of colors) works perfectly in this recipe! Olive oil. Use a high-quality olive oil for the best results. Any neutral tasting oil such as avocado oil, canola oil, etc. works well in this recipe. If you’d like to add some pizzaz use a flavored olive oil or another oil like walnut oil! Balsamic Vinegar. Ok folks, I am extremely passionate about balsamic vinegar. Extremely. There aren’t any other pantry staples that I recommend that are as expensive as high quality balsamic vinegar. An outstanding balsamic vinegar should be thick and naturally sweet. If your vinegar pours like water instead of like syrup and tastes sour then you do NOT have a quality product and your recipe will not turn out as delicious. Read: you will need to spend more than $5 a bottle to get the absolute best tasting balsamic recipes! Sea Salt. I recommend fine sea salt in this roasted beets recipe. However if you’d like to mix things up and use a flavored salt (like garlic salt) that is also a great choice!! Honey. Use pure maple syrup for a vegan version. If you are using the highest quality balsamic vinegar you can omit the sweetener. However I find that kids are more likely to eat and enjoy these roasted beets if I use a little honey/syrup! Grease a large baking sheet or dish, set aside. Peel and cut 3 beets into 1” cubes. Toss beets with 1 TBS olive oil and ½ tsp sea salt. Spread onto a greased baking dish in an even layer. After 20 minutes, stir and bake for 10 minutes more or until beets feel soft to the touch. Mix together balsamic vinegar and honey. After 30 minutes (or when beets are soft to the touch), remove beets from the oven and add the honey/vinegar mixture to the baking dish. Stir until all the beets are evenly coated. Return to the oven for 10 minutes, stirring once half way through. Roast until the balsamic/honey mixture coats the beets (and isn’t runny). Remove from the oven and serve warm or store and serve later over your favorite salads. 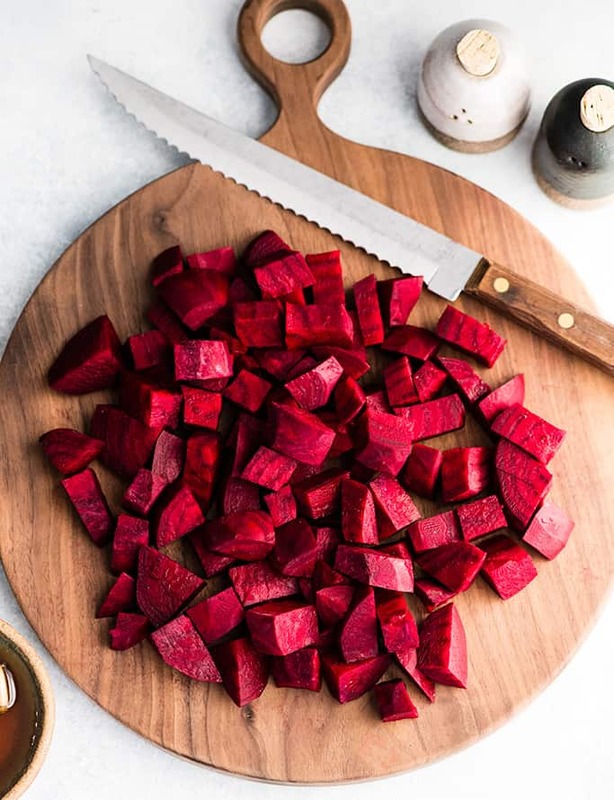 *Instead of peeling and cutting the beets, you could roast them whole in the following way: 1) Wrap beets individually in aluminum foil and set on a baking sheet. 2) Roast in an oven set to 450 degrees F until the beets are soft to the touch, 50-70 minutes depending on the size of the beets. 3) Remove skin from beets with your hands or a vegetable peeler. (at this point you can store the roasted beets until later when you’re ready to add the rest of the ingredients, dice and roast) 4) dice and toss with recipe ingredients. 5) Roast for 10-15 minutes at 425 degrees F until beets are soft and the balsamic mixture is thick and coats the beets. Really delicious! I added a bit of cayenne pepper, and after 20 minutes a bit of feta cheese, worked out very well. I love those additions Rachel!! I’m so glad you enjoyed this recipe!